According to the National Association of Professional Organizers, 80 percent of what we keep when organizing, we don’t even use. That means endless clutter and unnecessary items piling up and slowing us down. The National Soap and Detergent Association reported that getting rid of clutter could eliminate up to 40 percent of our housework. Think about how much of your life you could get back by only doing 60 percent of the housework you once did on a regular basis. 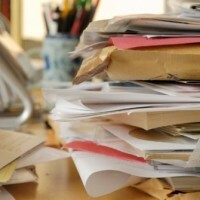 Still not seeing the effects of being disorganized and why staying organized is that important? There are plenty other reasons to save yourself time, money and aggravation. Being disorganized can lead to unpaid bills, late fees and finance charges, risking a hit to your credit score. Keeping poor financial records and not organizing your bill keeping can spiral and lead to late filing with the IRS, lost receipts and other penalties.Instead of trying to will yourself to open up your mail and pay those bills, automate your bill paying and make your life easier in the process. A personal finance app like Check.me can track your spending and sync up all your accounts in one place. Log in and pay all your bills at once and see exactly what you’re spending and where. Seeing everything you’re spending in one place can also alert you to fraudulent spending before it’s too late. Ignoring your clutter and disorganization leads to a dangerous lack of awareness of what’s really going on with your accounts. It’s easy for identity theft to strike victims who don’t check their credit card and bank accounts, and don’t bother monitoring their other online financial activity from investments to mortgages. Similar to Check.me, an app like Mint.com can sync up all your accounts in one place and alert you when balances are low or when large purchases were made based on your predetermined threshold. Using an online monitoring service can also help keep an eye on everything from when your information is used to open a credit card to credit inquires and address validations. The idea is to know exactly how your personal info is being used at all times and getting notified before it’s too late. Locking down your id online can mean the difference between a small nuisance and disaster in getting your credit history cleared. What about your laptops, smartphones, tablets, social media accounts and everyday sharing? Leaving your electronics in a state of unorganized chaos and misplaced files only leads to stress and opens yourself up to vulnerability. Keep your desktop tidy with password protected folders, and change passwords regularly to keep predators at bay. Ensure your computer, tablet, mobile devices and other electronics have antivirus protection or safety mechanisms in place to deter theft. Remember to share information wisely and safeguard your online sharing practices. Set your security settings on Facebook to high so only trusted friends and family can publicly see your posts. Listing the names of your children and important dates like birthdays and anniversaries can all be manipulated to crack your online passwords. The same goes for announcing when you’re going out of town. Telling the world your home is empty and your attention elsewhere is an open invitation to danger. Set your security settings on Facebook to high so only trusted friends and family can publicly see your posts. And just wait until you get back from vacation to announce you were miles away. It could mean the difference between finding your accounts hacked and safeguarding your financial future.